You probably spent a whole lot of time picking out the perfect wedding photographer and choosing the perfect outfit for your engagement photos. Why not use the new photos on your photo save the dates? 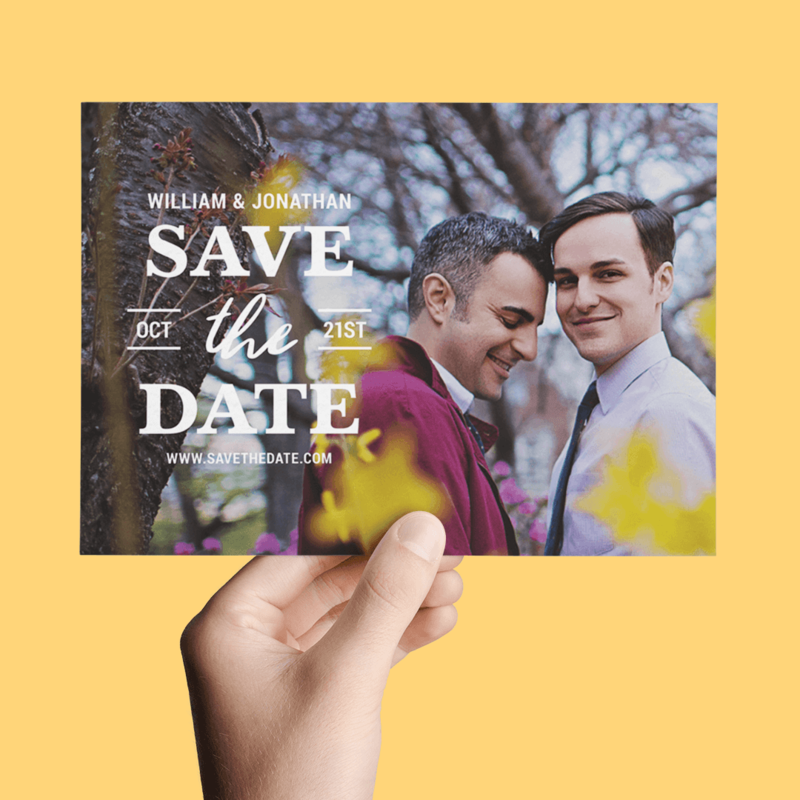 As much fun as it is to share those new photos on Instagram, adding them to your save the date cards will probably put them on your friends’ and family’s coveted fridges! But how will you ever choose? Your wedding photographer has likely sent you more photos than you know what to do with. 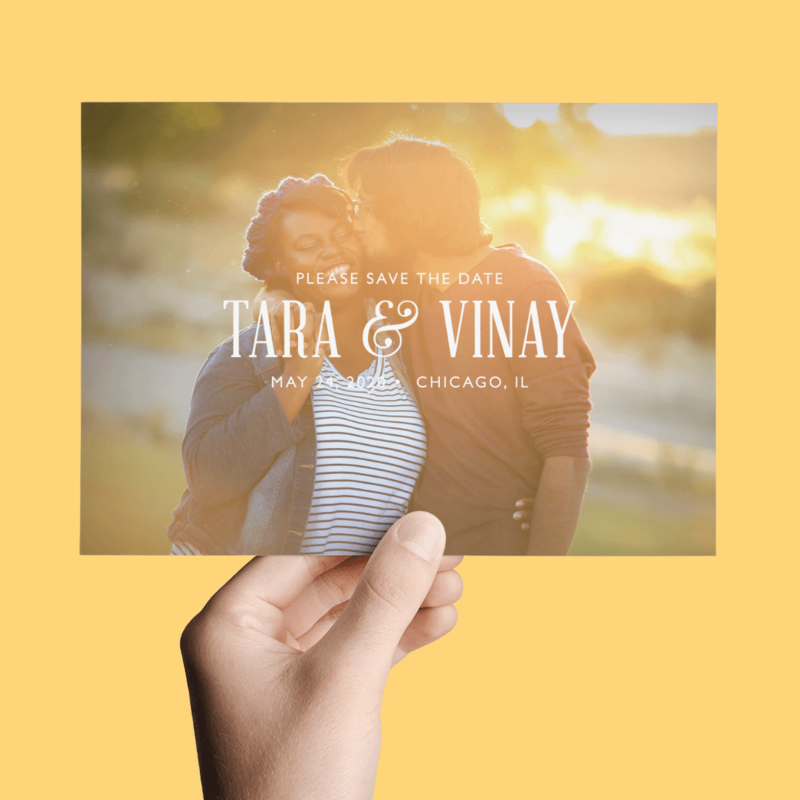 If you whittle down your photos to your top 5, you can then play around with different photo save the date templates and see which one you like the best. Remember, whatever photo and card template you choose, make sure to keep it in theme with the rest of your wedding. If you’re going for a beach themed wedding using winter themed save the date cards will not make any sense. At the end of the day, however, you do you. You don’t have to follow any strict rules, if you see a design that you absolutely love. Use it. 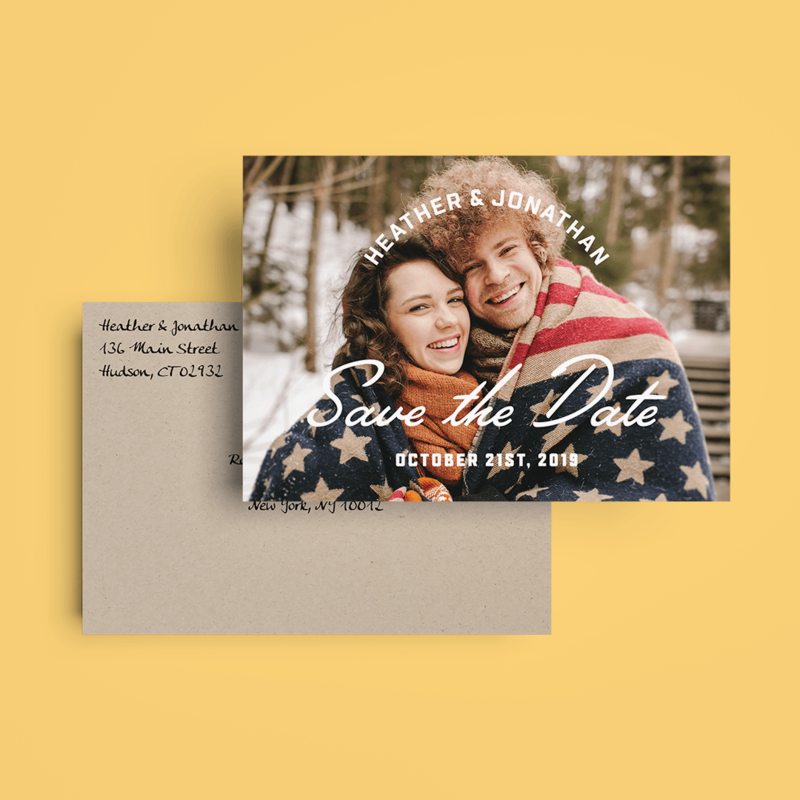 We’ve picked our favorite photo save the dates from the bewitching Postable collection for you to browse. Just click on the green ‘send it now’ button to test out your own photos on each template. As with most of these templates, simplicity is key. It’s your photo’s turn to shine so the rest of the text has been laid out accordingly to bring the attention on the photo. The scripted font on this custom save the date is really pretty and adds just enough pizzaz to this design without over-doing it. As simple as it gets. This design is one of Postable’s top sellers and for good reason. 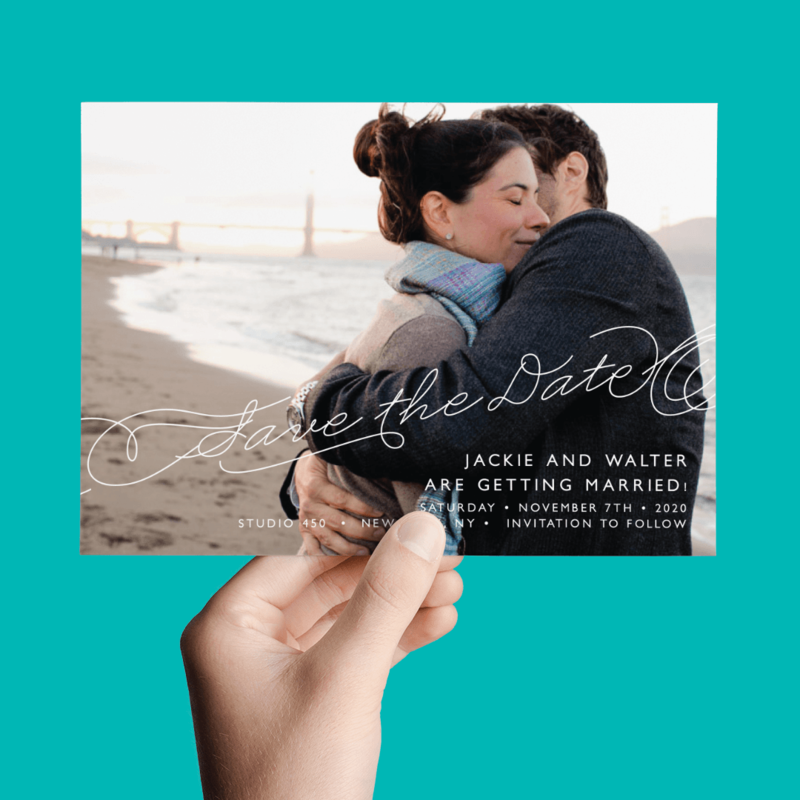 We love the way the Save the Date calligraphy allows the rest of the space to be used up by your very own photo. 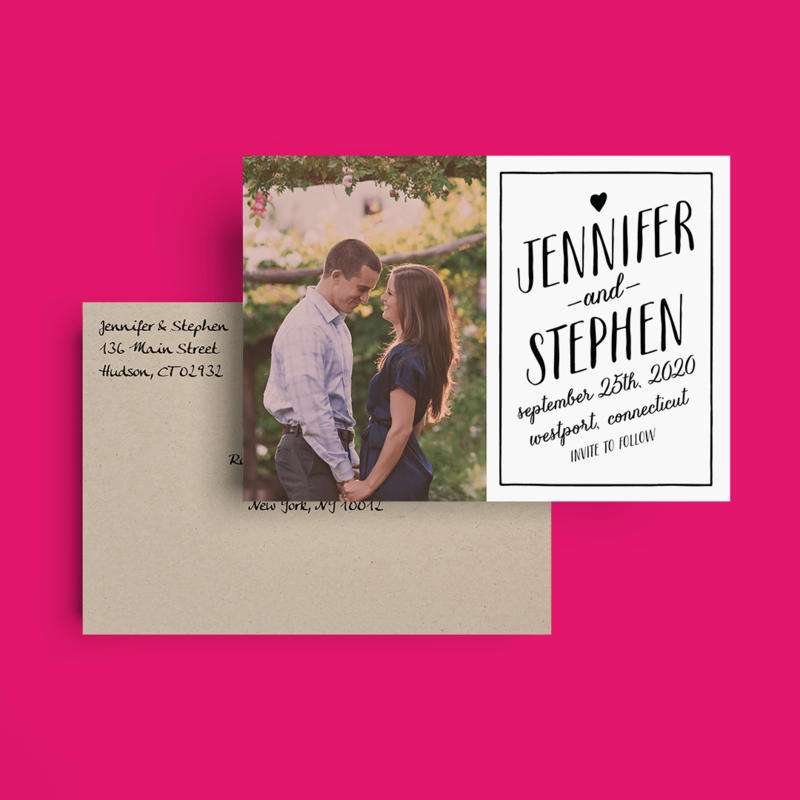 Pro tip: Add your wedding website to the back of the card where your guests can get more information on the big day. 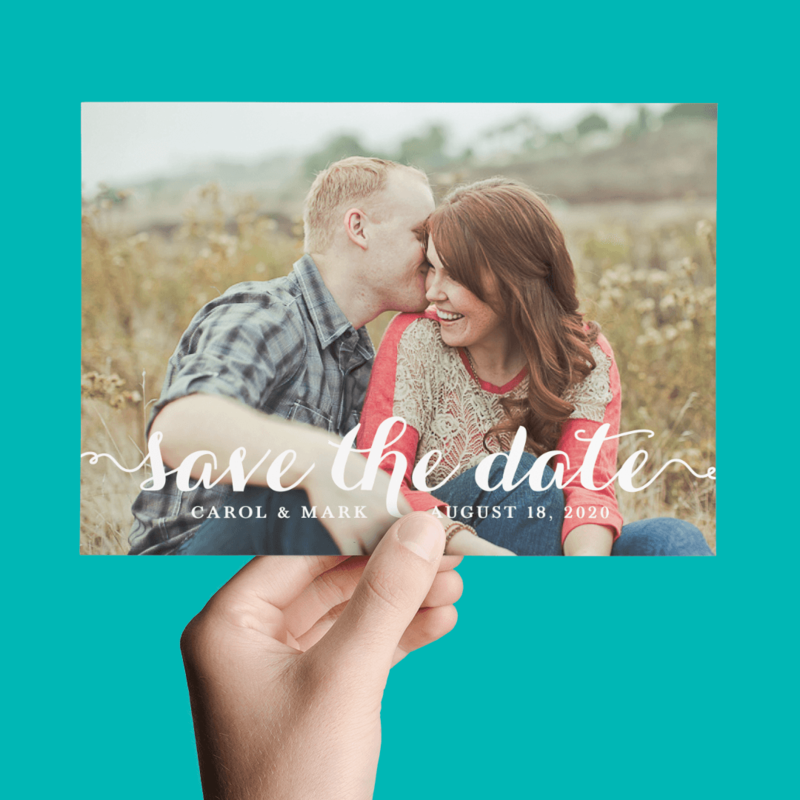 Use this custom save the date to frame the two of you in the center. 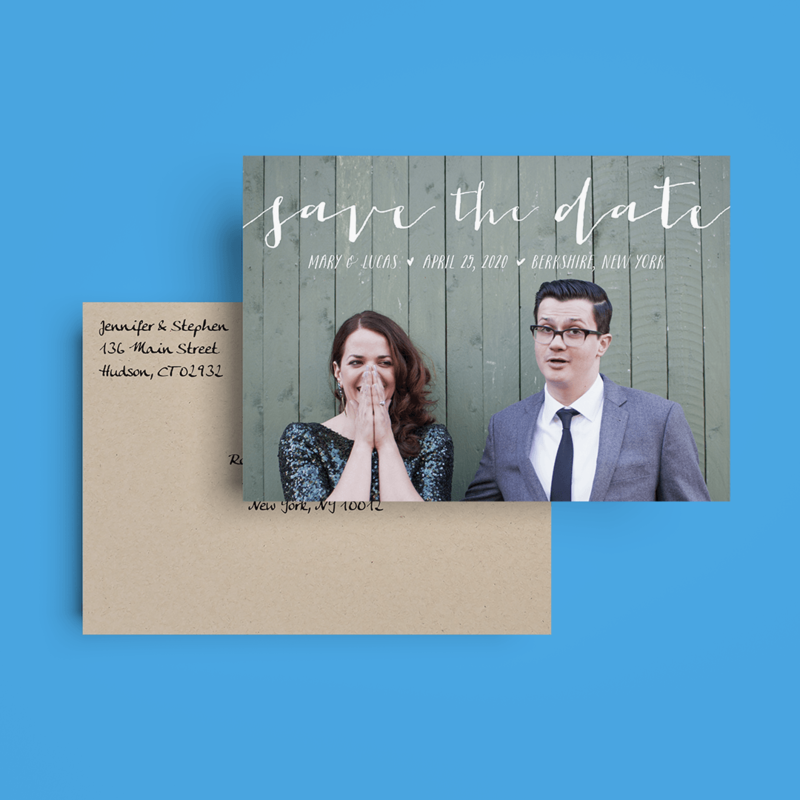 A modern twist on the photo save the dates with a simple script typography. Get creative with your engagement photo and use this unique design! The default image shown on this template gives you a great idea of the type of photo that will work best here. 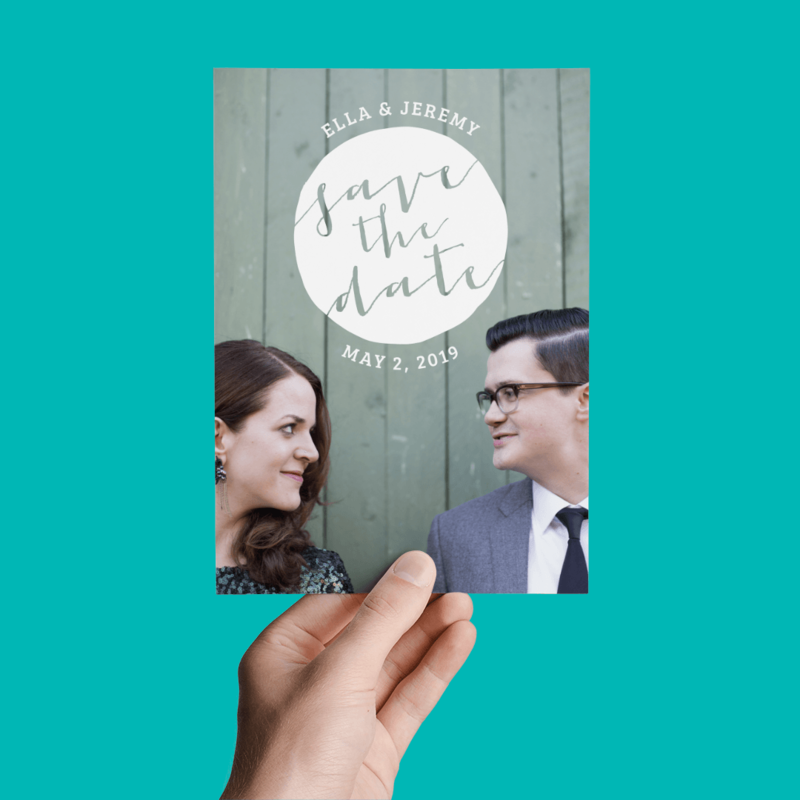 Classy save the date with a simple border to bring the whole design together. Your options for types of photos your can use on this one will vary so feel free to test a few options! 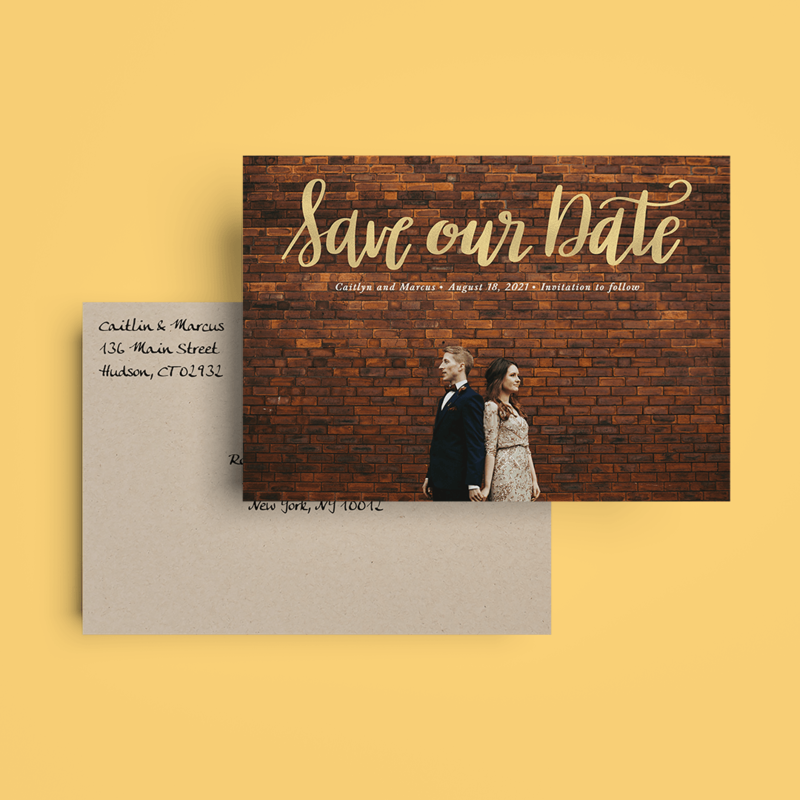 Another best seller from the Postable save the dates collection. This simple design has a really fun scripted ‘Save the Date’ right at the top so choosing a photo that fits will be a breeze! 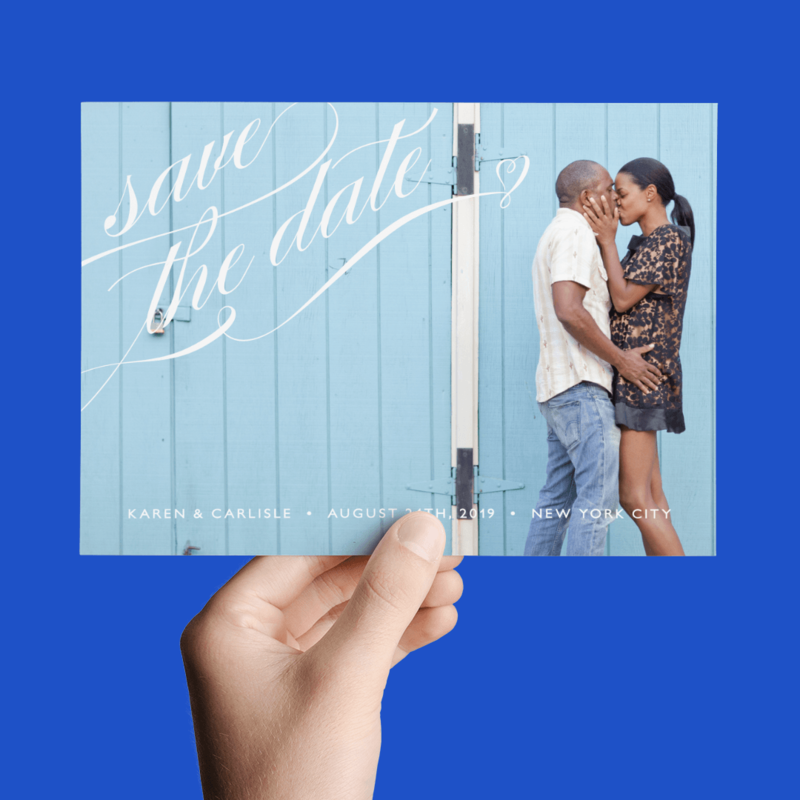 This custom save the date gets a bit more creative with the use of typography. For a more bold approach try this design and pick something where the two of you are closer to the right side of the image. One of the newest additions to the Postable collection, this classy design is already becoming a favorite. The gold scripted ‘Save the Date’ is used as a great accent while still leaving plenty of room for the rest of the photo. Another fun design where using small accents (like the small red heart) goes a long way. Although the block lettering sits in the middle of this design, the transparent letters still allow the photo to seep through. As with most of the photo save the dates, this one uses a scripted font for the main event. The longer and curlier accents to this font gives it a unique feel. Use this custom save the date that comes with a photo filter built right in. The overlay that goes over the photo you upload gives it a vintage feel and bringing the text out to pop a bit more. 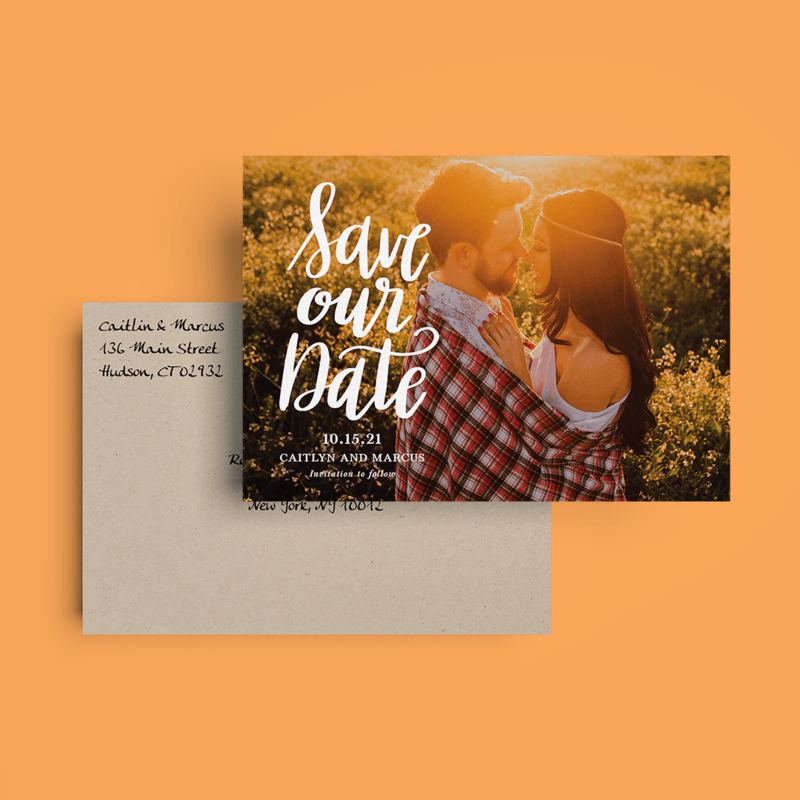 This save the date allows you to add a bit more text, but remember you can also use the back of the cards as well. 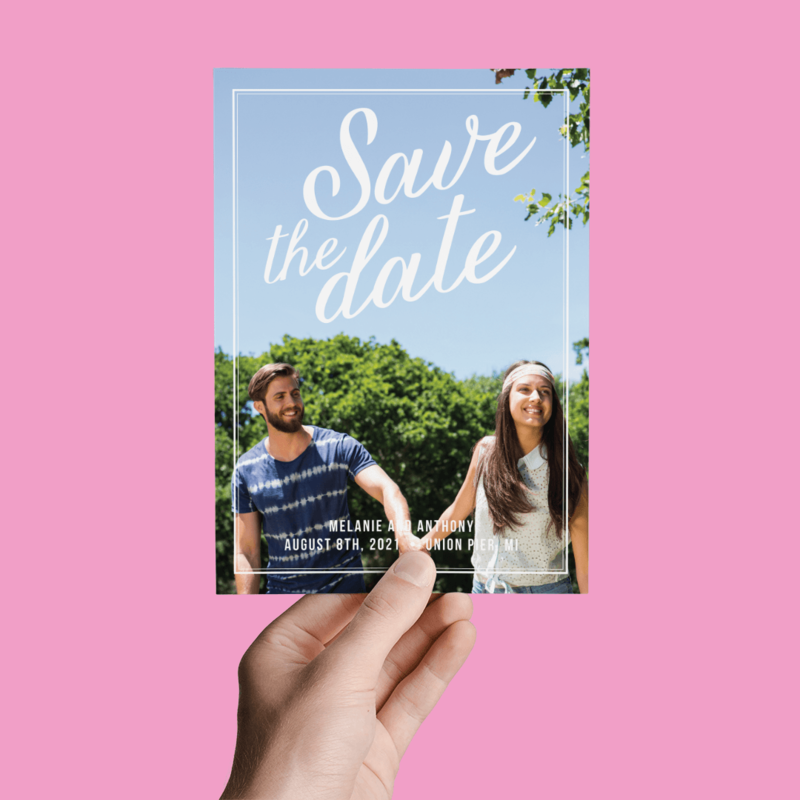 Remember — your save the dates should be simple and only give the bare minimum info. The wedding invites will be filled with more information. 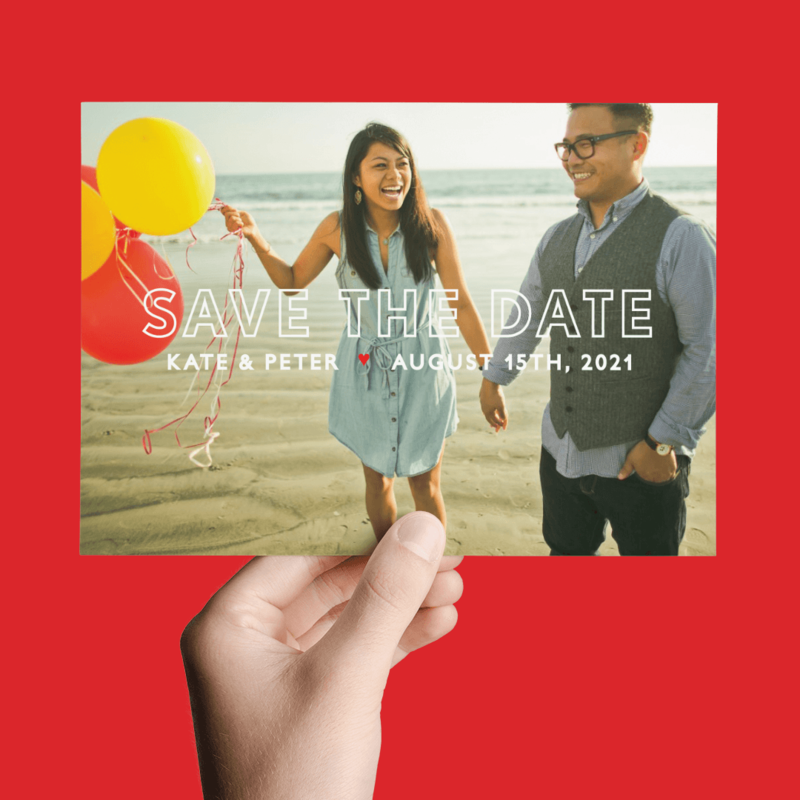 What makes awesome photo save the dates? Awesome engagement photos. If you’re still in the process of getting ready to take your engagement photos, we thought we’d give ya some helpful tips! 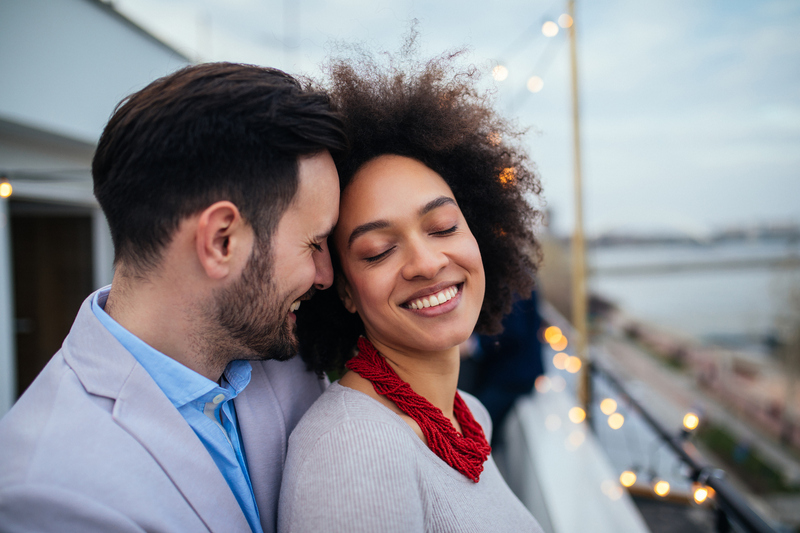 We asked Joann Rhodes from Rhode Studios, a wedding photography & video team from Orlando, some questions to help make the best of your engagement photo session. Great engagement photos make great save the dates. Q: What do you recommend couples wear for the engagement shoots? A: Bring 2 outfits! Casual and dressy. Something that reflects your personality and is comfortable. Think of the look and feel you would like to project. Q: Is there anything you need to know before going to an engagement shoot? A: If you would like to include your pet, have someone with you to care for the pet in between photos. If you would like to do a “themed” shoot, bring appropriate props. In FL it’s hot! So bring towels for sweating and makeup to reapply. Q: Is there anything you’d recommend for couples to avoid doing during their engagement shoot? A: Please do not bring an entourage! To many opinions! Try to have just a few photos ideas. You’ll want your photographer to use their skills to get you out of the box ideas. Q: What are the tips you usually give your couples to prepare them for an engagement shoot? A: If you are going to your hair and makeup trial, pad your time. In our experience the appointments run long and the bride wants to change her hair. If it’s going to be hot out, don’t wear dark clothes. Also the location you choose could have an activity so check the location out and have a backup plan. There ya have it! Use these tips to make the most of your engagement photos and create the perfect save the dates for your wedding.